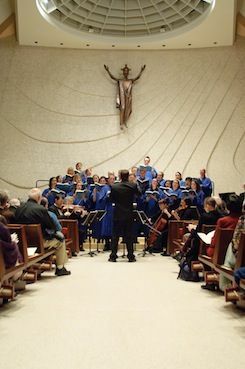 The installation of Tannoy QFlex 16's at Seattle WA's, Our Lady of Fatima, has allowed the church to eradicate difficulties parishioners had hearing the word, while maintaining the parish's ability to offer historically accurate musical performances. Since its founding in 1952, there have been many changes at Our Lady of Fatima, including the construction the current church in 1968. One long overdue change, however, was the replacement of an antiquated sound system. "It was at least thirty years old," said music director, Matthew Loucks. "Some speakers weren't functioning and many had been clustered on one side of the sanctuary, so to hear speech elsewhere the system had to be very loud - it was a really lopsided configuration." As part of a 2010 audio upgrade, a new pipe organ was purchased, wall-to-wall carpeting blanketing the 650-seat sanctuary's floor removed, and Terrazzo flooring installed throughout the sanctuary. While that enhanced the sound of the choir and encouraged the congregation to lift up their voices in song, it only exasperated the overall lack of intelligibility. "Even with the carpet, at the back of the room it was impossible to hear articulated speech," said Stephen Weeks, AV consultant and project manager for Lynnwood WA based, designer/installer Morgan Sound. To enhance speech intelligibility and subtly reinforce musical performances by resident ensembles and visiting performers like The Vienna Boy's Choir, Weeks relied on a pair of Tannoy QFlex 16, digitally steerable line arrays. "Overall they sound natural, clean and clear; particularly in the articulation of high frequencies. QFlex just does a better job in the 4k to 20k range than their competitors and we could manipulate the beam substantially, so less energy is directed at the front of the room and, as you go further back, it gets louder." In every design/install, Morgan Sound takes pride in meeting their client's needs to the letter. In house of worship projects they place additional emphasis on alleviating their client's concerns about the potentially intrusive impact modern technology may have on the congregation's worship experience. At Our Lady of Fatima, QFlex' compact footprint spoke directly to those concerns; mounted discreetly behind acoustic cloth to either side of the altar on an imposing white rock wall, the loudspeaker's impact, though substantial, is purely sonic in nature. "I have nothing but high praise for them," Loucks said. "There are only two speakers, but we didn't have to add any acoustic treatments - QFlex saved us from the hassle, the cost, and they allowed us to preserve the reverberant environment we wanted for music. When you're reading from scripture, you want the word to be understood all the times. Now, even when there are only a handful of people at our daily 8 a.m. mass, speech is highly intelligible."